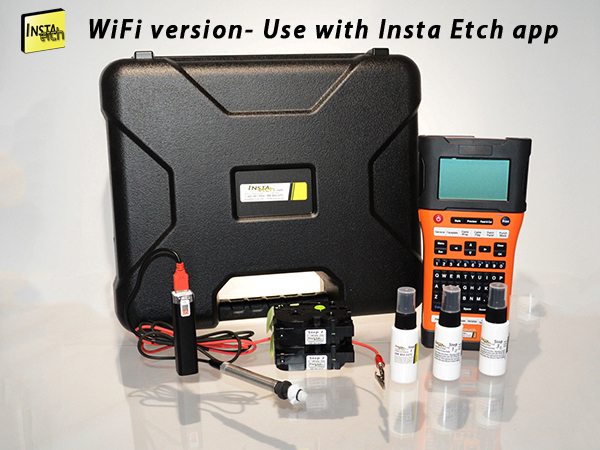 1650Metalwifi kit priced at $367 with 1" (24mm) high stencils with logo and barcode scanning option. (1) INSTA ETCH1650wifi - Handheld 180dpi high resolution printer up to1" wide 24mm) stencil format. (1) Etch5metal - 5v 1amp wireless, rechargable DC power supply. (1) Leadusb6metal - marking head power lead. (1) Etch30spray - Step #1 stencil adhesive. (2) Etch16st - Step Two 1" high 10 feet long (305cm) each stencil cartridge. Each enough for 30 longer (1" high x 3" long) stencils or 40+ shorter (1" high x 2" long) stencils. (1) Etch30electrogen - Step #3 general purpose electrolyte. (1) Etch30neut- Step #4 neutralizer spray. (1) Rechargeable Li-ion Battery and Wall Charger.